The potential for spring flooding due to snowmelt is elevated for portions of eastern Idaho and northern Idaho. The spring flood risk for the rest of the state is average or below average. There remains an elevated risk of spring flooding across portions of the Upper Snake Basin due to above average mountain snowpack. This includes the mainstem Snake River above American Falls Reservoir and the Henrys Fork near Rexburg. An elevated flood risk also exists across the Panhandle Region where some of the highest snowpack percentages in the state reside. 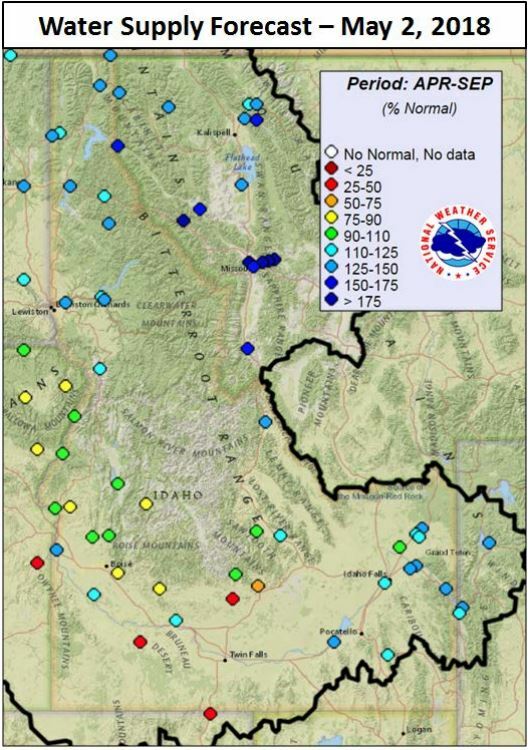 Elsewhere across Idaho, early May snowpack conditions suggest a low probability of spring flooding due to snowmelt. The primary factors in the development of spring flooding are the occurrence of persistent above normal temperatures, and rain on snow precipitation events. Even for areas where drought conditions exist, or that have low snowpack, spring flooding is possible under the right conditions. Additionally, burn scars can have a significant impact on local flood potential during spring snowmelt and rain events. 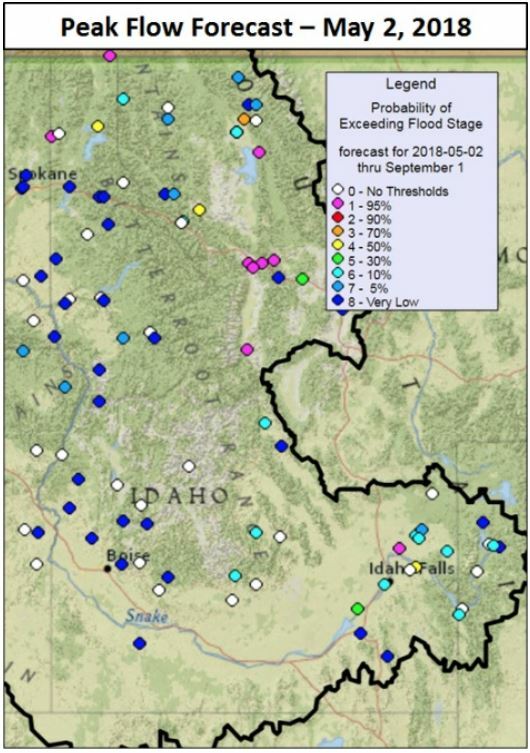 National Weather Service April through September water supply volume forecasts for northern and eastern Idaho, and the mainstem Snake River across southern Idaho range from 115 to 150 percent of average. Elsewhere, water supply forecasts are 85 to 110 percent of average for most of the Central Mountains and only 30 to 70 percent of average for south central and southwest Idaho. The lowest forecast percentages are in far southwest Idaho in the Bruneau and Owyhee River Basins at less than 40 percent of average. As of May 1, temperatures for the 2018 Water Year have been average or slightly below average across the northern half of the state while most of southern Idaho has experienced a little above average temperatures. Water Year precipitation was above average for the Panhandle, Spokane, and Clearwater Basins. The Clearwater Basin had the greatest anomalies in the state at 130 to 150 percent of average. The Salmon Basin and Upper Snake Basin near the Wyoming border were generally 100 to 130 percent of average. 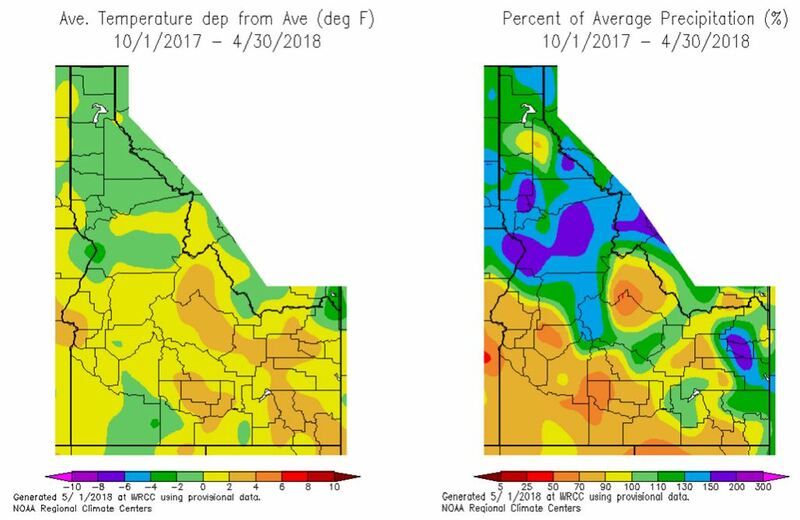 Elsewhere in southern and southwest Idaho the Water Year precipitation was mostly in the 70 to 90 percent of average range with pockets of around 60 percent. 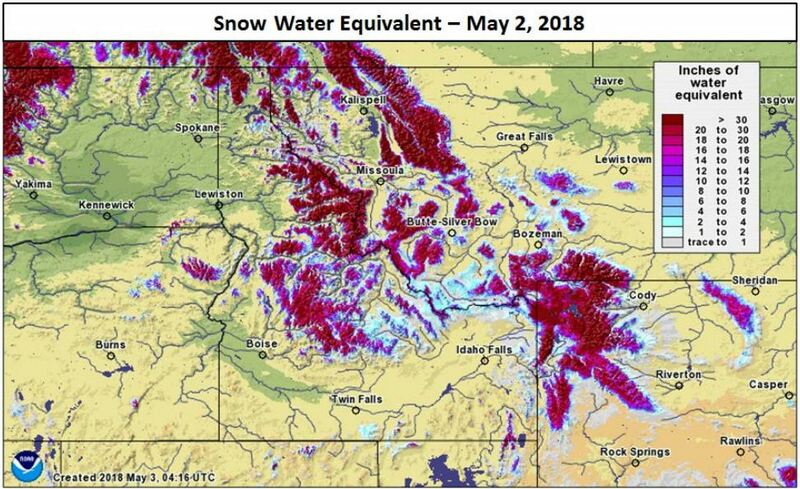 As of May 2, the highest snowpack percentages in the state ranged from 138 to 145 percent of median in the Clearwater, Spokane and Northern Panhandle Region. Not far behind were basins in eastern Idaho such as the Little Lost and Birch Basins, Henrys Fork, Teton, and Snake Basin above Palisades at 120 to 130 percent. 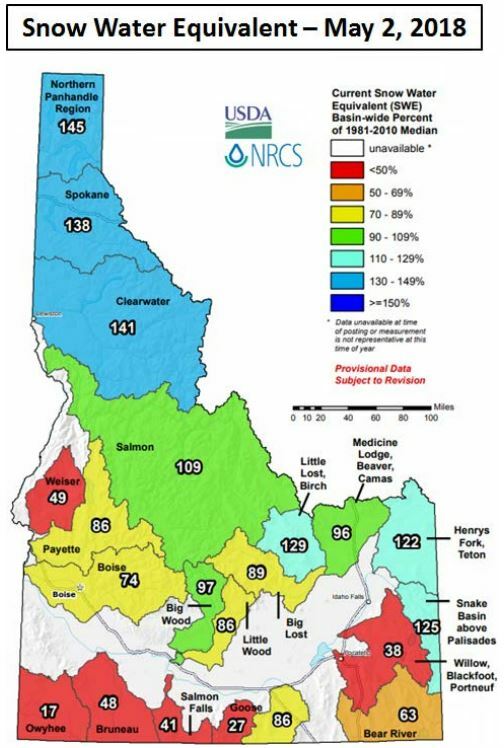 The Payette, Boise, Salmon, Wood and Lost Basins ranged from 74 to 109 percent of median. Southside Snake River Basins along the Nevada border were a mixed bag ranging from a low of 17 percent of median in the Owyhee Basin to a high of 86 percent of median in the Raft River Basin. Northern Idaho basins and those near the continental divide reached their peak snowpack in mid to late April. The low elevation snow is gone and melting of the high elevations will increase over the next few weeks as temperatures warm. Reservoir storage across Idaho is in good shape. 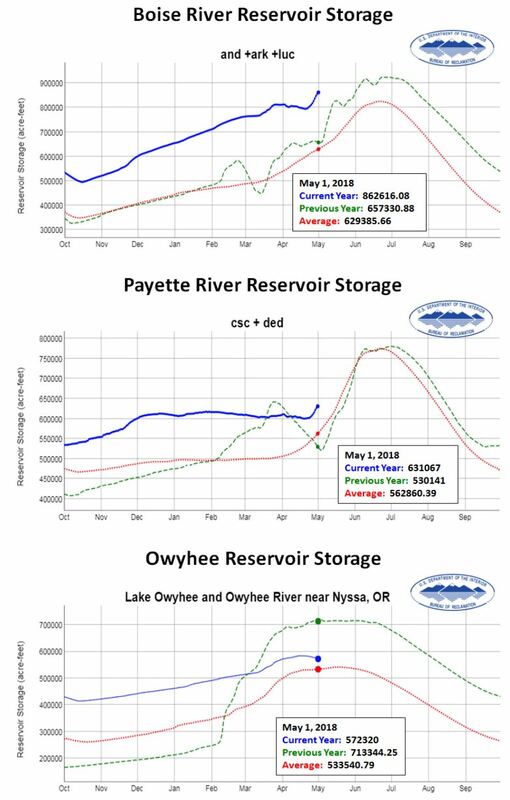 As of May 1, storage in major reservoir systems throughout Idaho was 100 percent of average or greater, except where systems were heavily drafted to make space for anticipated snowmelt runoff. 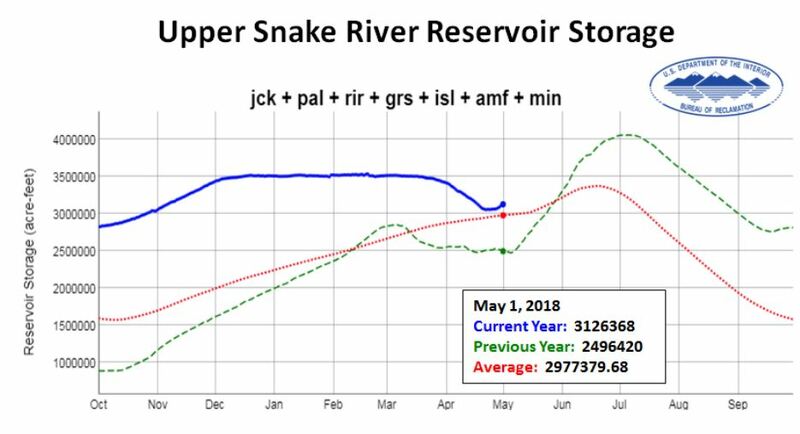 Weather patterns and irrigation demand will continue to drive operations through late spring as reservoirs are topped off. Wet spring weather or extended periods of warmth resulting in rapid snowmelt and large reservoir inflows could result in significant fluctuations in reservoir discharge and downstream river levels. Idaho is currently free from any official drought classification according to the U.S. Drought Monitor. However, below average precipitation for the Water Year and poor snowpack has put much of southern Idaho in the abnormally dry category. 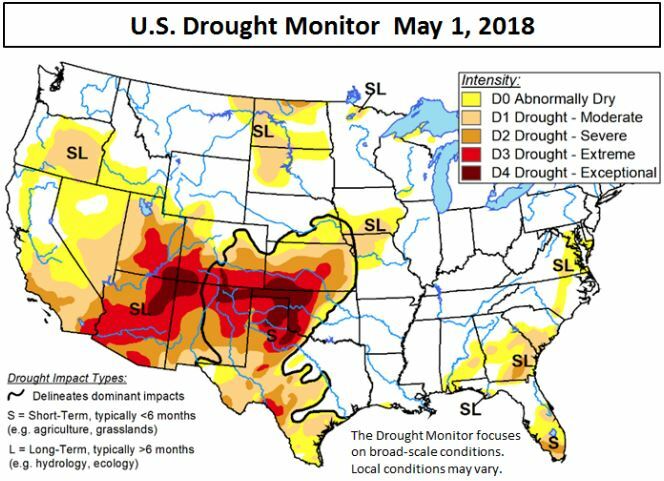 Weather and precipitation for the remainder of spring will determine whether or not conditions improve or deteriorate for areas experiencing the dryness. Good reservoir storage will ease drought concerns for those served by major storage projects. The outlook for May favors above normal temperatures across the state. The May precipitation outlook favors above normal precipitation for southeast Idaho and below normal precipitation for the northwest half of the state. The seasonal outlook for June through August favors above normal temperatures and below normal precipitation.